I got a “fat envelope” today. It’s from a show that I’ve entered at least four times without ever being accepted. There are a few shows that I keep trying to get into even if I know my chances are slim – just because they are either very prestigious or have a really great venue. This is the Raleigh Fine Art Society juried show. Raleigh isn’t a huge city, but it is nice. And the venue for this exhibit is NICE! 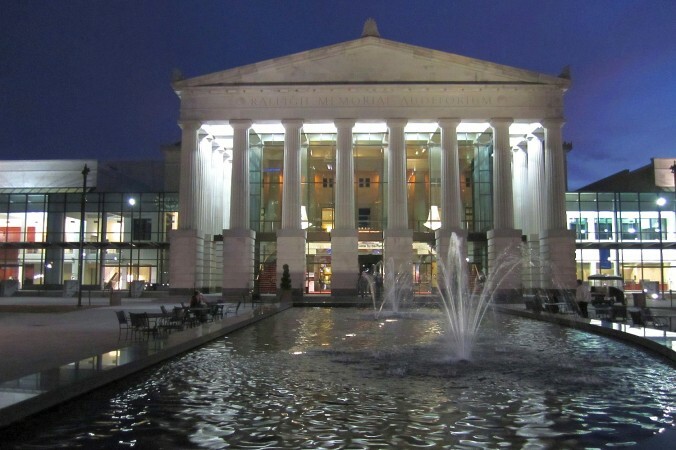 The Duke Energy Center for the Performing Arts houses four theaters and is the home of the symphony, ballet, and lots of the big cultural performances (and lots of the little ones too) that come through town. The walls are always hung with lots of art and people wearing fancy clothes look at the art before the show and during intermissions. That’s an exciting thing. I haven’t really been gung-ho about entering my quilts in national shows over the past number of years. I’m thinking about it and it must be at least five or six years, maybe eight (can it possibly be that long!?!?) since I had as much of my work as I could get out there in rotation to various quilt and art shows. I got tired of it. Lots of paperwork and packaging and shipping. So I’ve entered pieces as I felt like it in local art shows. I’ve also been honored to be included in several invitational shows such as the ones sponsored by Leslie Tucker Jennison and Jamie Fingal over at Dinner@8. So this surprise acceptance (I’ve come to think of my jury fee as a charitable donation) has set off some musings that I think I’ll share with you over the next little while. What kind of shows do YOU enter… and WHY? I’d love it if you joined the conversation. Ask me any questions you have. Share your opinions. Pull up a comfy chair, grab a cup of something yummy (my current favorite is herbal ginger lemon tea) and let’s chat! Congratulations!!! 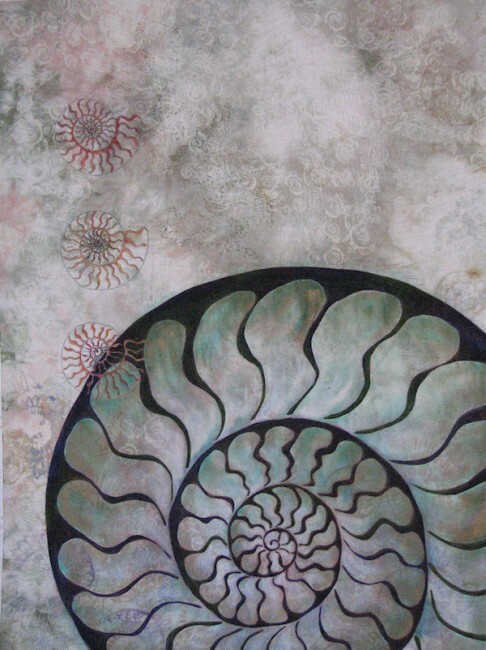 I love Ammonite Dream and thrilled that it was accepted. I don’t enter shows. I am a learner. I create because it makes me happy and learning makes me happy. I think entering shows would add a pressure that I am not excited about adding to my life right now. I applaud those who enter shows, but it just isn’t for me. I have been trying to enter at least a few big shows every year, but do find the shipping and entry fees a bit much at times. I have also entered a number of touring exhibits, but am beginning to not want to wait the three years or so for a piece to return to me. I think that my focus now will be more on finding local opportunities for exhibiting. 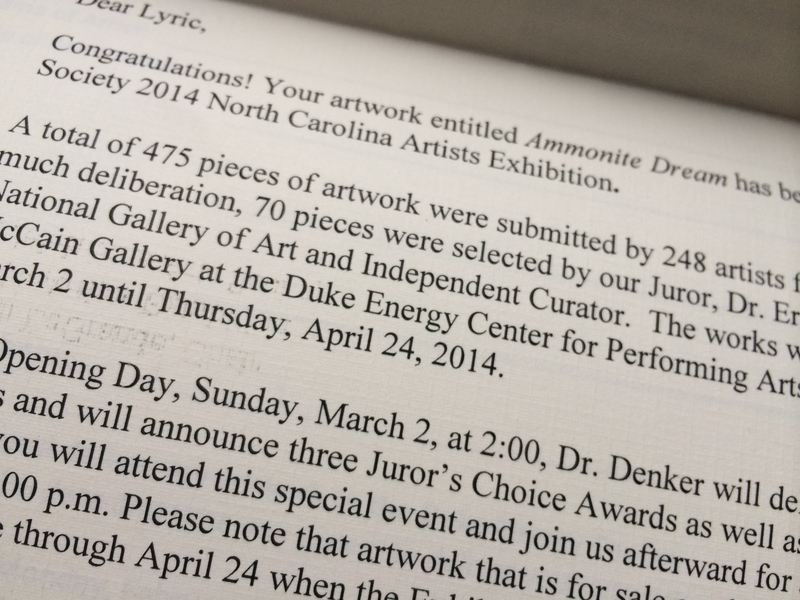 Congrats on getting into the Raleigh Fine Art Society show! Congratulations! No matter how many times we see that word, “congratulations” it’s always a thrill. I used to enter every show I heard about, because I wanted to get out there. Now I’m more selective. I always enter the LaConner Quilt Museum Quilt Fest, and (knock on wood) so far my Pacific Northwest themed quilts have always gotten that show and once got a prize. I also always enter Westcoast Wonders because my quilts fit the theme, and it’s a small traveling exhibit sponsored by Quilt Inc. that goes to Houston, Long Beach and a few other venues. I don’t usually enter SAQA shows because the themes are often out of my interest range, and the costs are too high. I mentally set $20 as my top entrance fee unless it is a show I really want to be in. I’ve been in a few group art gallery shows and public-spaces exhibits featuring themes of wildlife or public lands. Mostly I want to be in my studio cutting/painting/dying/stitching trying to figure out how to translate the image I have in my head into fabric. Lyric, periodically I look at your list of calls for entry, or the general calls for entry on the SAQA site, but I’m not obsessed with it like I used to be. I’ve been making art quilts for about 12 years trying out all sorts of techniques and styles. I think I’ve finally found my voice. So far I’ve only entered SAQA calls for entry and got accepted to one of them. Now that I have some more confidence, I’m going to branch out and enter more shows. I do hate deadlines. I do hate the process of entering shows. But so be it. Lyric, I have come to the same conclusion as you. I feel like the entry fee and shipping costs are giving money away, so I only enter shows in venues that make me feel very proud to have my work accepted. It does help to spur the economy, but I’d rather have something to show for it. I could be buying art with that money! Congratulations on your acceptance – that venue is impressive. Congratulations! I plan to get myself down there to see their exhibition when it is open. I didn’t even realize they had exhibitions there. I am still playing it safe and entering “quilt” shows mostly instead of “art” shows. I will enter the PAQA Whimsy Show at the end of the month, (locally displayed, but international exhibitors) with the show to follow in April. I will be excited to make it into that one. I’ve been accepted into the Mid-Atlantic Quilt Festical with the show at the end of February…. both art quilts were accepted, as well as another art panel which is a part of a group exhibit. It is new for me just to apply, but I agree with Teresita… it keeps me motivated and trying to improve my skills and exercises my design efforts. Congrats again! Hello Lyric, Congratulations in getting accepted to the show. My only wish is to be able to see your finished quilt at some stage, regardless of whether you win or not. I think you have already won as you have got your feet in the door now the trick is to keep it there! I hope your quilt really does very well. Congrats on the acceptance! I really enjoyed your piece a while back on submitting to quilt shows vs fine art shows. I just had my first acceptance into an international show where I haven’t a prayer of winning anything, and am considering all the packing/shipping/expense, so I see how you got tired of it! But your show in Raleigh sounds grand! Hey there- congrats on the fat envelope! I am a lurker on your blog, and enjoy your posts a lot. I enter occasional shows and got an acceptance email recently as well! The thing I am constantly applying to, and I joke, I receive my annual rejection letter, is a residency. I mix it up- sometimes MacDowell, sometimes, Yaddo….. Never accepted, but I keep trying! Lyric, CONGRATULATIONS!!! Say it to yourself too! 😀 Wonderful news and I am thrilled with and for you!!! I usually try to enter as many art exhibitions as possible. I’ve been rejected probably as many times as I’ve been accepted, and I must say it always puts me a bit down. It is difficult to make people see quilts as art, at least my quilts. On the other hand, I’ve earned some prizes over the years, so I can’t complain! I found out that working for shows with deadlines is a great motivation, it activated my creativity and curiosity for new techniques, and of course, it demands my best efforts. So on the whole, whether accepted or not, I find that entering shows is a very, very positive experience for me. 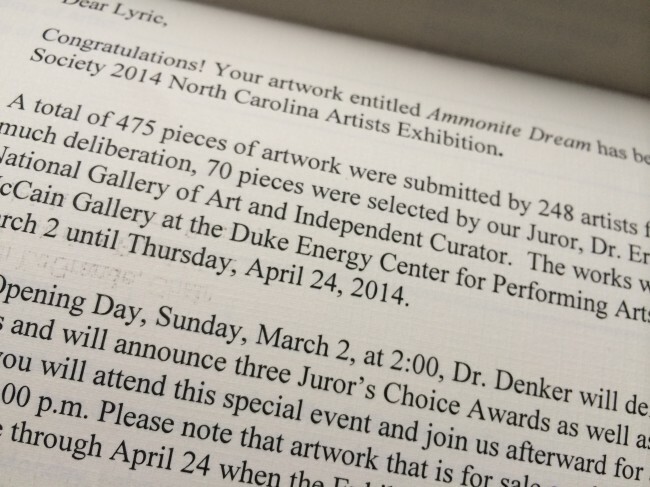 I’ll be looking forward to see pictures of the Raleigh Fine Arts Show!